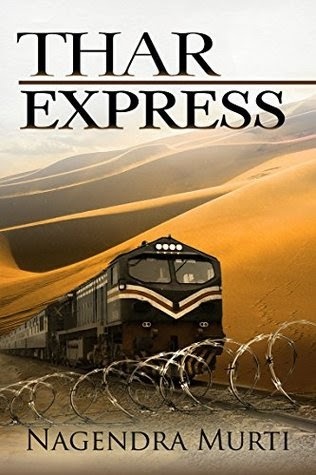 Thar Express by Nagendra Murti is a thrilling tale of self-discovery of a person who has lost his memory to an untoward accident. Once you start reading the book, it will keep you hooked. Your curiosity will be put to rest only after you have turned the last page. There are several twists and turns in the story that will keep you on the edge of your seat. The anticipation of what-is-going-to-happen-next is always there and that's what makes it an exciting read. I received an e copy of the book from Blog Adda in exchange for a unbiased review. "Am I dead? Is this how it feels to be dead.....? Thar Express tells the story of a man who is rescued from the aftermath of a landslide near the India­Pakistan Line of Control. He is barely alive and appears to have no memory of his identity, his past or the circumstances that led him to a remote and sensitive part of the country that he was rescued from. After initially being cared for in an army hospital, he is sent to a doctor who specializes in treating those afflicted by memory loss. Under the unconventional but effective care of this doctor, he begins to remember tiny fragments of his past and sets off on a journey of re­discovering himself that leads him across seven different states and brings him in contact with people who wittingly or unwittingly help him along in this journey. The army intelligence, initially suspicious of his antecedents and intent but with no hard facts to act on, stumbles across information that pushes them beyond suspicion. They launch a relentless manhunt to re­capture what they now consider to be a dangerous insurgent. Will the authorities’ worst fears come true or are they just chasing an illusion? The story takes the reader through twists and turns, introduces characters who represent the eccentric mixture of mirth and cynicism that is twenty­ first century India and unfolds the unexpected ending." There are several facets of the story. First it dwells on the anguish of a man who has lost his memory. It is aggravated by the fact that there is no one from family or friends who can take care of him and help him in getting back his memory. Not only this, since he is found in a remote and sensitive part of the country, the army and the police suspects that he might be a militant who might be feigning memory loss! It also touches upon the diversity we have in India. Mano - the protagonist knows Kannada, Marathi, Hindi and little bit of Oriya. That is commendable but it does make tracing where he is exactly from more difficult. We also get glimpses into how our army and anti-terrorist squads work. As Mano travels through out the country in search of his past the readers can't help but marvel, at how the story of his life unravels. The writing style of the author is impressive - it is crisp and fast-paced. The narration never falters, so the story had the readers attention all the time. The ending is fitting but unexpected. For a debut author it is undoubtedly a commendable book. The book is available online only as an eBook at the moment. I hope a paperback version will also be available in near future.